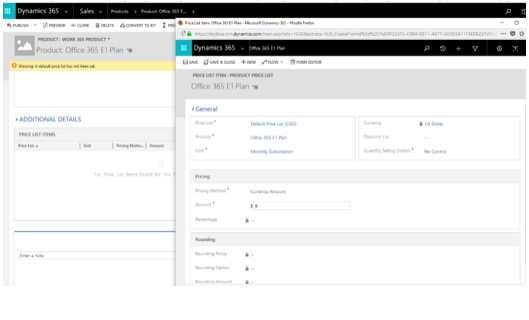 Work365 Integrates with the Product Catalog to facilitate the creation of Subscription Items from the Product Catalog. With this configuration and settings in place, you will be able to look up a product from within the Subscription and automatically provision with the Integrated Provider like the Partner Center. The subscription will also Setup the child subscriptions if it is a bundle and will display the Monthly Unit Sales price. Perform these steps as the System Administrator. If you are using an Automatic Provider Like Microsoft Partner Center – you can provision products directly from Work 365. If you have multiple Partner Centers setup it is important to have individual Products for each Partner Center or to leave the Provider field blank. This way you can specify the Provider during the Provisioning and subscription setup process. Once you save the product update Default Price List setting. Scroll Down to the Additional Details section and Add a new Price List Item. Set the Monthly Subscription Selling Price and Save this Price List item. The Monthly Unit Selling Price is populated using the Configuration Items in the Work 365 Configuration Settings. Use the Default Unit and Default price list settings from the Configuration//TODOReferToConfiguration settings to populate the Subscription Price. The Product is Now Setup for use with Work 365. To Use the Product Publish the Product.